NAIROBI will seek an explanation from Addis Ababa after Ethiopian soldiers killed three Kenyan police officers in foreign territory, Kenyan media reported Sunday. Kenyan security forces including the army have since been deployed to the border following the Friday incursion, the Sunday Nation, the country’s largest circulating, reported. The Ethiopian soldiers are said to have entered Kenyan territory and shot the officers in an ambush before destroying a police vehicle and seizing a reported four fireams. The bodies of the slain officers were Saturday flown to the capital Nairobi, Kenyan authorities said. “All cross-border issues are supposed to be addressed at diplomatic level, hence we will be seeking an explanation from Ethiopia on why this happened,” Moffat Kangi, the County Commissioner of Marsabit, the northern region in which the incident occurred, told the publication. “We want to know why they engaged our police yet we have never intruded into their territory,” Mr Kangi said. 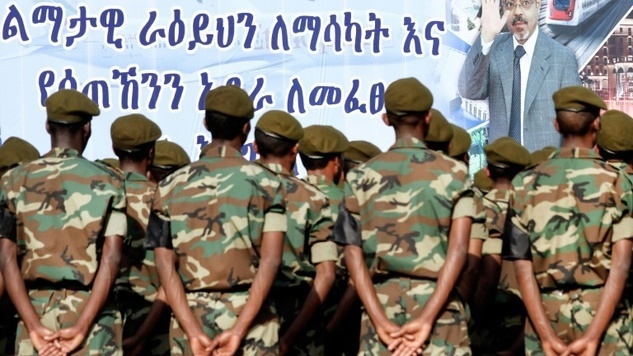 The Ethiopian soldiers are said to have been pursuing members of the proscribed Oromo Liberation Front (OLF) who had killed an Ethiopian chief on Thursday. But Mr Kangi said they had not received any prior alert from Ethiopia. Ethiopian soldiers have reportedly crossed into Kenya five times in the last nine months. Established in 1973, OLF has been pushing for the self-determination of the Oromia region. The Oromo are the country’s largest community with 30 million members, or a third of the Horn of Africa country’s population. The central government will have none of it, the region being a breadbasket and accounting for nearly two-thirds of its top export coffee. Rights groups accuse the government of “ruthlessly targeting” the ethnic group with Amnesty International in October 2014 releasing a report that claimed the torture of thousands of Oromos. Kenya and Ethiopia are allies, and have a defence pact dating back to the days of Emperor Haile Selassie and Kenya’s independence leader Jomo Kenyatta. The two countries were so closely allied strategically, Kenyatta gave Selassie a generous piece of land close to State House Nairobi for Ethiopia to build its mission. But the latest incident, coming on the back of other incursions, is likely to test those relations.